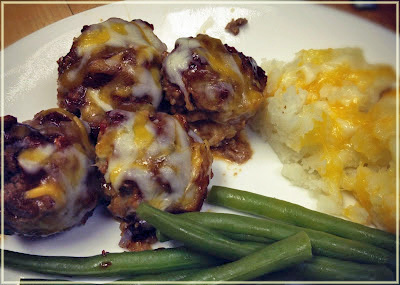 I found this great Mini Meatloaves recipe over at Faithful Provisions over a year ago and I have been making it at least once a month ever since…my Husband, Little Man and I absolutely love it! My parents even do too, I have made it numerous times for family gatherings. Mix all of the ingredients, except for the toppings, with your hands until well mixed. Make sure you do not over mix. Add either BBQ Sauce or Ketchup. (I usually do 1/2 and 1/2) Add the cheese 5 minutes before they are done. Your Mini Meatloaf looks really good. I like the addition of the salsa. I would like to invite you to come to my Full Plate Thursday on Thursday. Thank you for sharing and you have a great week! what a super cute idea! my family is crazy about meatloaf! never had it with salsa, but think i’ll give this recipe a try! This looks easy. 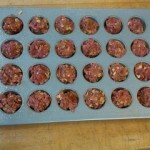 I like the muffin pan. I provides great portion control. Yummmm…. I will have to try this. I love meatloaf!